It was hell in the supermarket this morning. I was going to write a serious piece about another local pest, ticks, which are making my life a misery just at the moment but after I'd done a bit of research I felt so ill I've decided not to bother. You can get all the unpleasant details here. One tip I will pass on, and I can recommend it as it worked very effectively to remove a parasite from the poor old cat is this; take some fine cotton thread and make a noose with a loose slip knot. Gently position this around the head of the tick as close as you possibly can next to the skin of the victim, really low down, then tighten it and the tick will come off. Be careful when positioning the thread not to squeeze the tick's body and make sure the cotton is absolutely at skin level otherwise you risk some things that make me feel sick just to think of them. Swab the area with a little disinfectant afterwards. While Paul was here we decided that there were enough of us present for an attempt to free our waterlily, Barbara Davies, from the weed that was encroaching on her and her protective netting. We had to net because of water rats which nearly did for her in her first year. It's unattractive but at least it's functional. Unfortunately she's in the middle of a pond. 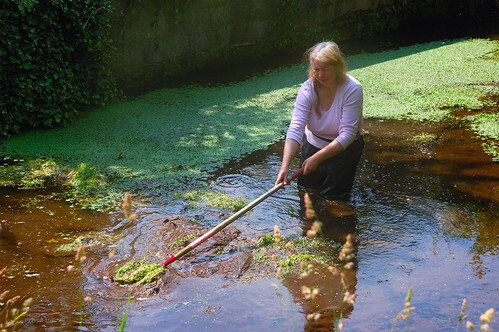 Well, good for her, obviously but less good for the one chosen to do the wading, particularly, and you may not be able to make this out in the picture, when the wading requires not just walking through water but sloshing through several feet of fine claggy silt. We have plans to extract all this valuable organic matter as a contribution to our compost heaps but we're still investigating the best possible prices for pumps, so for the time being any pond work is a messy task. Barbara is now free, I hope she'll flower for the first time this year although there are no sign of buds. The rest of the pond needs work but I won't be venturing back in without bankside support, I'm too frightened of a horrible end.